Blue Monday was founded by Susanne Wollin, Katrin Weiger and Geoff Grainger in September 1992 after an initial meeting in "Nautilus" in Bremen-Vegesack and was conceived as a pure beginners group, the social side being considered more important than the musical. Blue Monday was joined by in the same year by Regina Wieseler who set the social tone in the founding period i.e. champagne and wine drinking along with cigarette smoking go perfectly well with recorder playing, even simultaneously! The group's name "Blue Monday" was arrived at by the fact that they rehearsed weekly on Mondays and that the German for blue (blau) has various meanings to whit: being drunk, taking an unjustified day off work or just having the blues. All terms seemed quite apt! The major items in the repertoire at that time included Prelude by Gustave Charpentier , Kindersinfonie by Joseph Haydn and Trumpet Voluntary by Jeremiah Clarke . 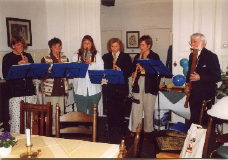 With the arrival of Jutta Meyer, a very experienced player, together Susanne Urhahn and Doris Buth, both former members of The Schwanewede Recorder Consort during 1993 the accent shifted increasingly to the musical side where items such as Canon by Johann Pachelbel , Quartettino, Sonata in F by Alessandro Scarlatti and Two Fantasias by Giovani B. dalla Gostena were then taken up. In 1995, Jutta Meyer, who played a significant rôle in Blue Monday, became Jutta Köster and returned to her home town in Großenkneten, Lower Saxony. Marianne Krebs became a member sometime in 1995 for a few months and introduced a number of works, most notably Trio For Three Flutes by James Hook which became a firm favourite in the ensemble. Blue Monday reached its pinnacle with the arrival of Bettina Kiefner, Nadia Zaman and Ursula Horstmann in 1995. Under Bettina's gentle direction such works as Eine Kleine Nachtmusik by Wolfgang A. Mozart , Concerto I by Johann Christian Schickhardt and The Leaves Be Green by William Byrd were undertaken with gusto. In 1996 Bettina Kiefner departed for Emsdetten whilst Nadia Zaman married and emigrated to the USA. Their places were taken by Frau Kugel, Petra Sakrak and very briefly by Nannette Wiethölter, and Ingrid Rethfeld. Blue Monday finally disbanded in Autumn 1997.